For obvious reasons, this site takes the position that The Simpsons was and is the greatest show ever. (Zombie Simpsons naturally excluded.) Of course, plenty of people disagree about that for one reason or another, but the nice thing about being a Simpsons advocate is that I get to cite examples, lots of them. For instance, this week we have a link to an article about the best sitcom of the 1990s, the author presumes that The Simpsons is grander than all of them and excludes it because it isn’t quite a sitcom. We also have an interview with Anne Washburn, author of the Mr. Burns play, in which she discusses considering and rejecting a number of other television shows for her premise. We also also have someone explicitly saying the show will never die while pretending to praise Zombie Simpsons. And that’s before we get into the tattoos. 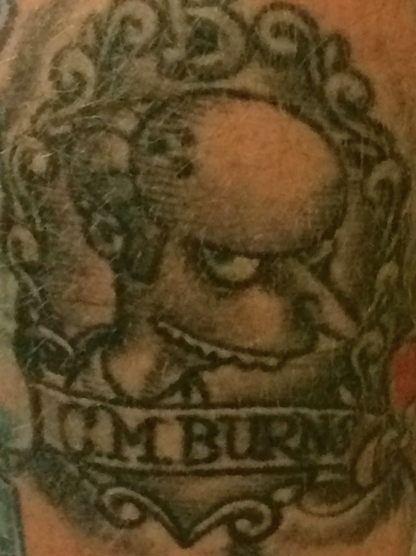 And while I can think of no reliable source of information to prove it, I’m willing to bet that Simpsons is the most tattooed show in history. Oh, and we’ve got usage, fan art, and all the other usual stuff. 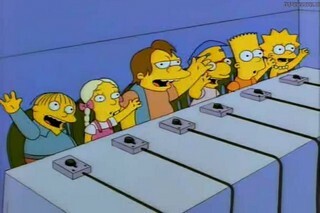 Q: What about “The Simpsons” do you think captures people’s imaginations enough that it would survive a nuclear meltdown? A: I think people would remember really enjoying it. And it’s a show in which the humor is so verbally precise that lots of people enjoy the act of remembering it even now, and so I think chunks of it would be in readiness. You can have a debate about Newsradio versus other shows. You cannot have one about The Simpsons. It’s so absurd that it gets its own explanatory parenthetical in the opening paragraph of an argumentative article at a mainstream media site. The Simpsons Get A Film Noir Makeover – Some of these paintings I’ve linked before, but I think the Mr. Plow one might be new. It is gorgeous. As a child, I was allowed to watch The Simpsons. Other children my age weren’t so lucky. Some parents considered The Simpsons as an evil that could negatively effect the minds of their innocent children. It was to be avoided at all costs. Usually when I see that statement, it’s “As a child, I was NOT allowed”. Good on your folks. Why is this important? Well, I suspect what all of these conservative parties have done, including National, is held focus groups where they’ve asked people whether they support more investment in roads. In response, many of these people have said “yes”. Something like these guys. The Simpsons makeup! – The Marge makeup as used by an actual person. Bravo on the two tones. Simpson Characters V2 – Fan drawings, including the rather clever and awesome “Sideshow Warhol”. I quite enjoy the new Simpsons’ episodes. Granted, they are not as great as the glory years, but I quite enjoy the long-running series’ hot takes on political issues. And, I can always keep re-watching the old stuff, too. Hiekkamyrsky Helsingissä – I’m not sure what this all says, but if you scroll down you’ll find a well done Simpsons family, with couch, in beach sand. “Elvis” is being marked return to sender, address unknown. ABC is removing its critically acclaimed series from the scheudle and says it will return at a later date. Despite a strong lead-in from “America’s Funniest Home Videos,” “Elvis” has been getting destroyed in the rations nationally by Bart, Homer and the rest of “The Simpsons”. According to IMDb, ABC dumped the rest of the episodes in the summer then canceled it. Day 196-Simpsonized – A simpsonized caricature, part the first. Day 197- Simpsonized – And another. The Joy of Glitches – I gave up on Tapped Out a while ago, but that is pretty cool looking. Bartkira! – Is Bender sneaking in there too? -The animation of Mt. Sinai is terrific. It’s the kind of quality you can only get with hand-drawn animation. I really wish at least one animated show nowadays would go back to hand-drawn. There was a Peanuts special a few years ago that did that, and it gave the cartoon some nice, charming feel. -There are lots of funny things going on in the background at the beginning. People beating the crap out of each other, guys chasing woman, and my personal favorite: Homer (the thief) stuffing his shirt with calf idols every time the carver-guy turns around. Don’t worry, they’ll be wandering out there two weeks, tops. Brazil legend Pele to lease forehead for commercial advertising – Pele is king of the soccer field, to be king of your lapels, use Crestfield wax paper. How I’m Feeling Of Late – Heh. Has ‘Bob’s Burgers’ Surpassed ‘The Simpsons’? – Zombie Simpsons? Of course. I think they did that about ten minutes into the pilot. New trending GIF tagged television the simpsons the… – Remember The X-Files? They’re back. In .gif form. 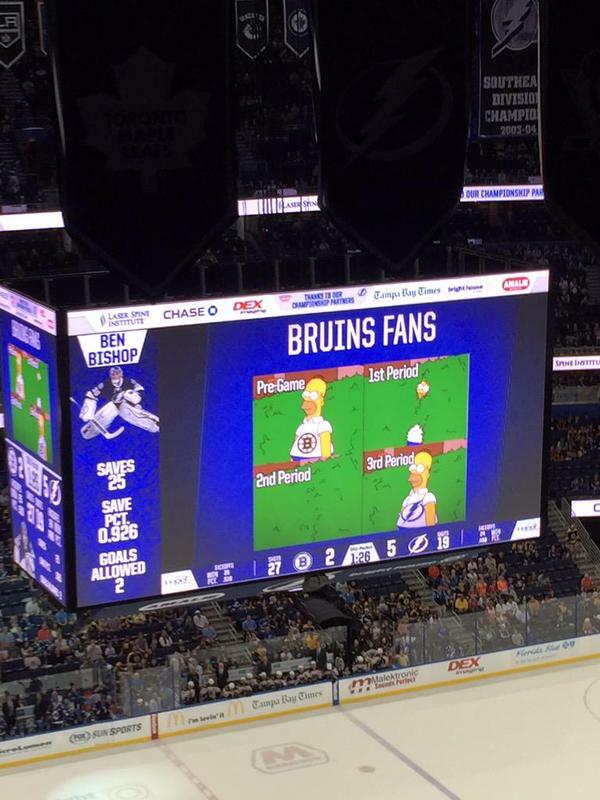 New trending GIF tagged the simpsons season 8… – Poochie would like you to recycle. Happy Birthday, Spock! 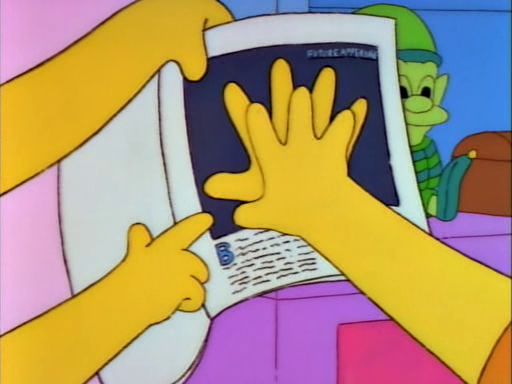 – No reason not to have some more Nimoy love, including Simpsons YouTube. Every Sunday at Tattooed Mom, there are free arts and crafts. For the lousy Smarch weather, we’re going to have a Simpsons themed night. 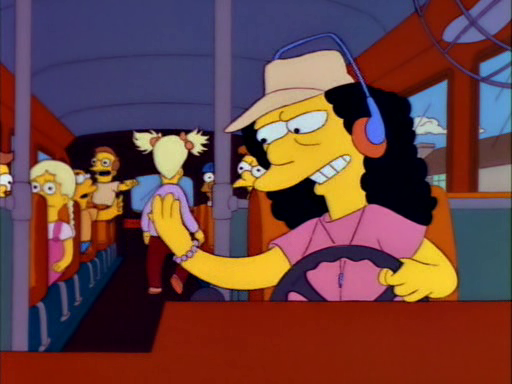 Classic Simpsons episodes will play, Ninties episodes only! You will learn how to draw the Simpsons, color the simpsons and paint eggs from Vincent Price’s Egg Magic. If you’re in or around Philadelphia, that’s happening Sunday night.